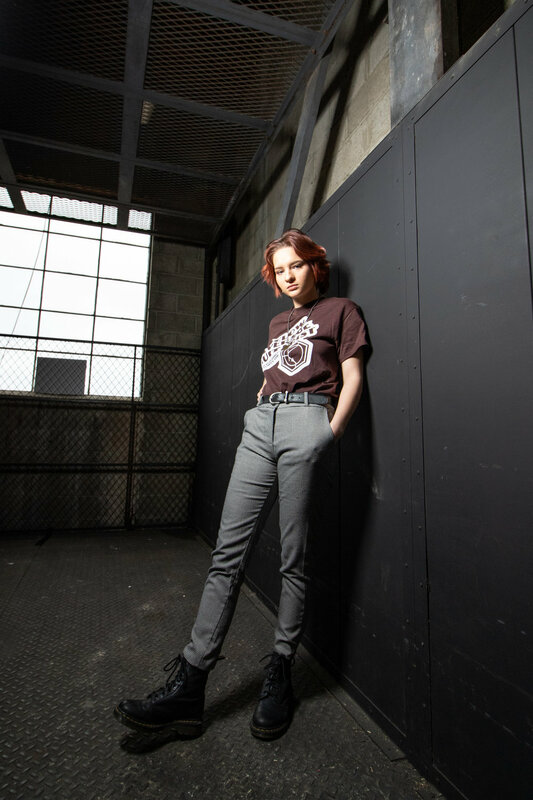 This shoot was for Rare Buzz Effects New Tees with model Riley Dean of the band Snarls. In the image below you can see one of the set ups I used for this session. I used a combination of a speed light with a soft box as my main light and an LED as a kicker to highlight Riley from different angles. I like to mix it up so there are some images with just one light too. In this image you can see the main light hitting Riley on the left and the kicker with a blue gel hitting on the right. In this image I chose to let the blue light take over as the main for a more funky feel. The orange light you see is actually just window light. I love shooting “blind” - Meaning shooting in a fresh space I’ve never been. Gets my creativity going and allows me to think of shots like this in the moment. Pulled down the freight cage and used it as a foreground element. I shot the couch images with just my main light. I really dig the raw creative space Rare Buzz works out of and thought it’d make for a good set up for a few photos. These last few images I photographed Riley on a plain ole’ white wall with two lights. I love simplicity like this at times because it allows the subject and product (tee shirt) to be front and center and not have any distractions from a busier background. When you use lighting in your photography it really opens up endless styles and different techniques. These two images show the before and after. Two light set up, same main light and the tiny hint of blue kicking on the right is the second. In the image on the right you can see how I edited the image and added some color in to make it pop. Portrait shoots can be approached many different ways. I like to go in with an idea of concept, style and lighting choices after figuring out wants and needs of said client. However I always leave an open thought process. New things like shooting through a freight elevator fence or the client may have a new idea on the go. Being versatile is very important in my daily work.